In February 1944 10th Battalion, The Gloucestershire Regiment arrived from India on the Arakan Peninsula in Burma. The battalion had been formed in 1940, and in April 1942 had been converted to 159 Regiment Royal Armoured Corps. The new tank regiment had arrived in India in December 1942 and joined 32nd Indian Armoured Division, but in March 1943, it was converted back to infantry and the 10th Gloucesters were reborn. The battalion was part of 72nd Brigade together with 6th South Wales Borderers and 9th Royal Sussex, and 72nd Brigade came under the command of 36th Division, led by Major General F.W. Festing, who later became affectionately known to the troops as “Front Line Frankie”. “I went up into the centre of the position and was soon chatting to the Platoon commander. His story, briefly, was that they had reached the North Feature without trouble and on the arrival of the second platoon – commanded by a Sergeant – the Patrol Commander had sent them through to see what was on the South Feature. They approached down the west side and reached the summit without seeing anything. Then the leading Scout (a Pte.Venn who received the M.M. for his part in this battle) looked over the top and saw two Japs, stark naked, sitting on the edge of a trench. He coolly walked over the top and shot them both, and then advanced towards a bunker position beyond. Grenades started to rain on him, but miraculously did him no harm. He in turn threw his grenades at the slits in the bunker but unfortunately failed to hit them. The rest of his section came up and fired a bit, but owing to the proximity of darkness they decided to withdraw as the position was a very strong one. This they did, and in such good order that there were no casualties and no one was even lost. “As the Japanese held absolute air superiority over Myitkyina, I felt I ought to ask what protection we had whilst flying in. There was a long silence on this, and then the suggestion was made that we stuck the Bren gun through one of the Dakota’s windows ands shot down the fighters. I thought I had better not tell the advanced party about this until we got into the aircraft. The task that fell to 36th Division was to establish a road link to the south, all the way back to Ledo, from where they had flown. The first objective given to General Festing by Stilwell was Taungni which, after a long march by the division through difficult country following the line of the jeep railway line and some opposition, fell on 19th August. 10th Battalion lost many more men to sickness than combat, although numbers were restored somewhat after a period of rest. The British were soon to come up against the veteran Japanese 18th Imperial Division, which had taken Singapore in 1942. At Pinwe, 10th Battalion was to have a hard fight against these troops during November. The Gloucesters were relieved on 26th November, and Pinwe fell two days later. By the end of the year 10th Battalion were across the Irrawaddy and concentrated at Kunchaung. 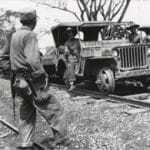 Picture: The Jeep Railway, Northern Burma, 1944.